Elton Brand’s long-awaited return to the Philadelphia 76ers will be on hold until at least Saturday. Brand dislocated his right shoulder December 17th and worked out on the court before Monday’s game against Dallas. He was placed on the inactive list for the 16th consecutive game. Coach Tony DiLeo said Brand most likely will play Saturday against the New York Knicks. The 76ers are 9-6 without Brand and have won a season-best seven straight games entering Monday. They were 11-14 when the 6-foot-8 forward was sidelined. Despite missing 13 of his first 14 shots and 16 of 23 overall, the seven-foot forward hit a turnaround 17-foot jumper over Reggie Evans at the buzzer to give the Dallas Mavericks a 95-93 victory against Philadelphia, snapping the 76ers’ season-high seven-game winning streak. Nowitzki received the inbounds pass with 4.3 seconds left and spun around the 6-foot-8 Evans to deliver the game-winning shot. Nowitzki finished with 24 points, Jason Kidd had 22 points and 12 rebounds and Jason Terry added 20 for the Mavericks (24-17). Lou Williams scored 25 points, while Andre Iguodala had 18 points and 12 rebounds for the 76ers (20-21), who are trying to climb above .500 for the first time since Nov. 23 when they were 7-6. 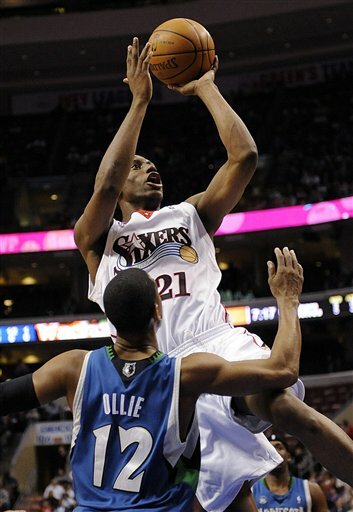 Andre Miller added 12 points for Philadelphia, whose four-game home winning streak ended. Andre Miller’s 3-pointer over Michael Redd with 28 seconds left helped the Philadelphia 76ers hold on for a rare road win Wednesday night, 110-105 over the Milwaukee Bucks. Miller led the Sixers, finishing with 28 points and 9 boards and 6 assists. With only 49 seconds left, Miller went down the floor and Redd barely reacted, looking for a pick and expecting a drive when Miller pulled up and answered with a 3 to push the lead to 107-103 and seal the deal. Lou Williams scored 12 points and Thaddeus Young 10 for the Sixers. Milwaukee got 26 points from Charlie Villanueva, 18 in the second quarter, 20 from Redd and 11 from Ridnour. Nearly one year since Stephon Marbury last played in a regular-season game, and all signs are pointing towards the former Knick outcast will eventually make his comeback with the Boston Celtics. Sources told ESPN.com this week that Boston is Marbury’s preferred destination if he becomes a free agent and that the Celtics are indeed hopeful of signing him. Sixers forward Elton Brand will be sidelined for a month because of a dislocated shoulder. The 76ers leading scorer has a fracture and tear in his right shoulder but will not need surgery. Brand was hurt Wednesday night in a 93-88 win against the Milwaukee Bucks. Brand is averaging 15.9 points and 9.8 rebounds per game this season. Detroit Pistons guard Allen Iverson was fined $25,000 by the league on Tuesday for making inappropriate comments toward a fan in a win at Charlotte. Iverson made some obscene comments to a fan with 6.2 seconds remaining in the third quarter during the Pistons’ 90-86 victory over the Bobcats on Saturday. It is still unclear as to what AI really did say.